The weather was chilly and windy, so Vivian Rose was bundled up with heavy tights, a long sleeve shirt and sweater. Even so, she moved at her standard lightning speed and almost outran the adults trying to keep her out of the duck pond. 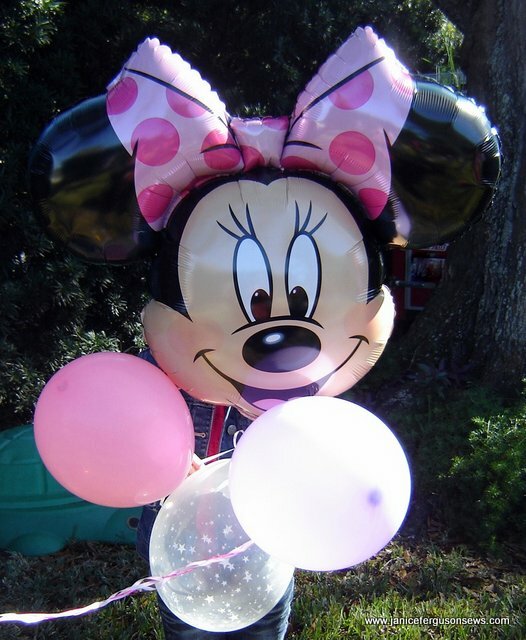 DisneyWorld is a favorite outing for the family, so in the early planning stages of her birthday celebration, Minnie Mouse was the designated theme, for both the party and her dress. Minnie Mouse, the famous rodent, redolent in red and black. 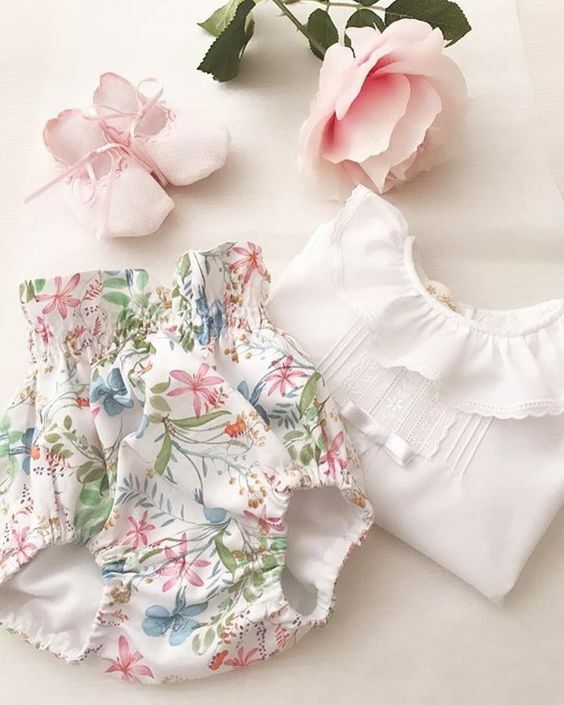 Hmmmmm….So The First Birthday Dress was not to be Kathy Neal’s lacey Mary Claire, not PBJK’s smocked Corrine Elise, not Primrose Lane’s feather stitched Brooke? Sigh. But in no time at all I was really into it! 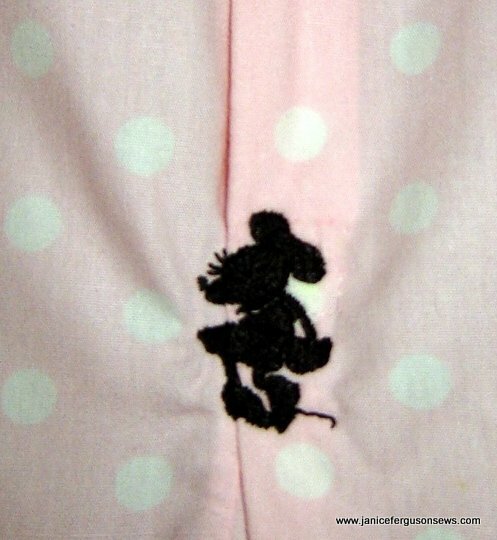 When I realized that Minnie now is often featured wearing pink polka dots– PINK!??? ?–I knew I could work with that! I ordered pink polka dot Pimatex, pulled from my stash some white pique, a tiny black and white gingham and all the other goods. My faithful Brother ULT 2003D has some suitably sized Minnie designs that I substituted for the butterfly embroidery on Wendy Schoen’s Baby Butterflies pattern. The black entredeux and Swiss trim I had planned to use did not work out. That was a bit of a disappointment because that black entredeux is the nicest, cleanest, most perfect entredeux I have ever seen. Using it in the traditional manner of its definition, “between two,” was just plain messy. When the “two” to be joined were white pique and white Swiss trim neither white or black Madeira Cotona thread rendered an acceptable look. So this sweet Swiss trim whose entredeux holes accommodated black floss was used. Selecting the size for a new pattern is always tricky. Vivian Rose is a big girl who wears off-the-rack clothes in sizes 12 month, 18 months and 2T. So I chose the size 2 option for the dress and it was too large. But my Rebecca loved it anyway and plunked Baby Girl in the dress for the festivities. It was a very chilly day so she had to wear heavy tights, a long sleeved shirt under the dress and a sweater. When the wind picked up, she added a fleece parka. Still, she was adorable. I enjoyed adding the little details to the dress. With GREAT effort I replaced Minnie’s little pillbox hat with a bow and embroidered three hairbowed rodents down the front of the dress. Tiny black buttons fill the spaces between Minnies. More of these same buttons are perched at the peak of each pinstitched scallop, mimicking mouse ears. At the back of the back opening, I added the little Minnie silhouette. I often remember Elizabeth Travis Johnson’s admonition to add something special to the back. Please excuse these awful pictures–it was one of those impossible days. The weather was much like the day of Vivian’s party, cool and very windy, so the dress rarely hung straight long enough for me to snap a pic. When I decided the pictures had to be retaken, it began to rain. 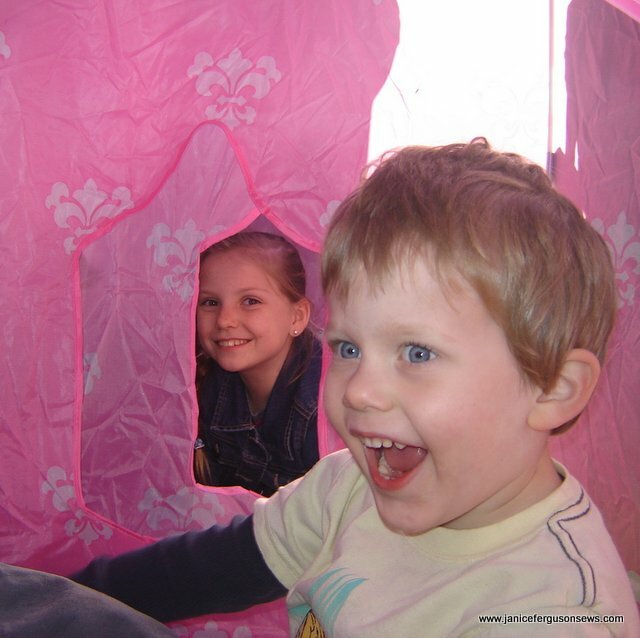 When I moved the photo session to the back porch for the natural light, the batteries in the camera died. Frustrating! All things considered, I was pleased with the way the dress turned out. Now, if we can just get this little girl to accept a hairbow by the time the dress fits, she will be an even more adorable mini Minnie. This entry was posted in Disney, heirloom sewing, infant clothing, machine embroidery, Madeira applique and tagged birthday dress, Disney, Madeira applique, Minnie Mouse. Bookmark the permalink. Absolutely adorable. Your creativity is just awe inspiring. So absolutely adorable! I can’t believe she’s one year old already!! Where on Earth did you find black entredeux? When I needed it I had to make it. Weaving the black floss through the entredeux is a much cleaner look, much better than rolling and whipping the entredeux fabric. Good idea. Cold and windy in Florida? We’ve had a high pressure system parked over the West Coast for what seems like months. No rain or even moderately cool weather in the foreseeable future. Sew, sew sweet. Thank you for sharing. Thanks, Heidi. I needed to get creative for this dress to satisfy my daughter’s request and my taste. Cynthia, Martha Pullen had the black entredeux marked down for the Dec. sale. I can’t recall just what the price was, but it was well under $2, maybe less than $1. It is soooo perfect! Why can’t they make white entredeux that nice? I’m sorry you’ve had such rough weather. We’ve had much more rain than average and for that I am grateful. Thanks, Stevied. 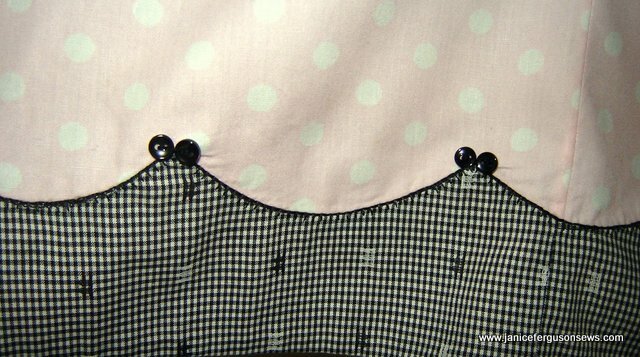 Pink is always sweet–sew much easier to make a girlie dress with pink and black than red and black. from Martha Pullen forum: THAT IS SO CUTE! SHE WAS BEAUTIFUL IN IT! from Martha Pullen forum: Oh my, how adorable is that!! What a darling birthday girl in her beautiful dress!! I love the mouse ears (black buttons) on the points of the hem band scallops!!!! from Martha Pullen forum: It’s been a year already?? Oh, my!! from Martha Pullen forum: The dress is absolutely gorgeous!! Your attention to detail is awesome! What an imagination you have, Janice! 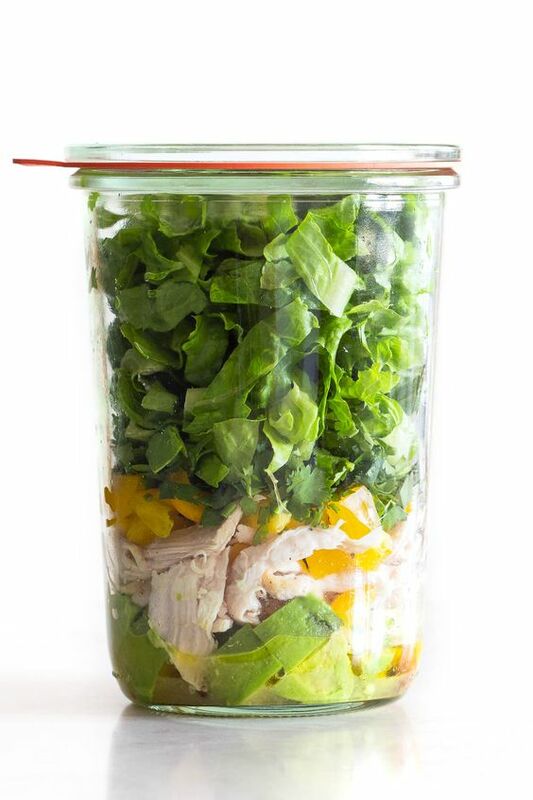 from Martha Pullen forum: Love it, love it, LOVE IT!!! 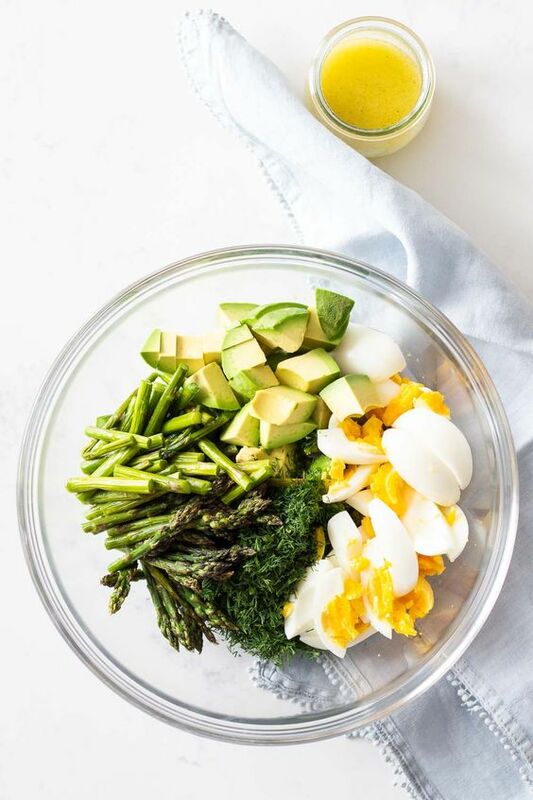 from Martha Pullen forum: Oh my! What a delightful dress! It just goes to show that traditional heirloom is not the ONLY way to go! from Martha Pullen forum: Wow, the detail is amazing. I love the way you have carried the theme right through the dress with the buttons and the little mouse on the back. Vivian Rose is a beautiful little girl. from Martha Pullen forum: What an adorable birthday dress!! I love all the details you put into the dress–It’s soooo cute. I can’t believe Vivian Rose is already a year old!! She is a beautiful child, as are Alastar and Laurel. from Sew Forum: What a sweet dress. from Delphi: That’s so cute. You can make her a heirloom dress for Easter with and the frills on it. Well, Jo, it had a hood! And it was a fleecy, fuzzy fabric. Isn’t that what a parka is? Tell me, Arctic Girl. from Martha Pullen forum: Oh my goodness, how cute is she and her birthday dress! I hope you took a zillion pictures of her first birthday party. I have that pattern but haven’t made it yet. One look at the cute dress on the package and I HAD to have it and now I see it looks even better made up. Just adorable. 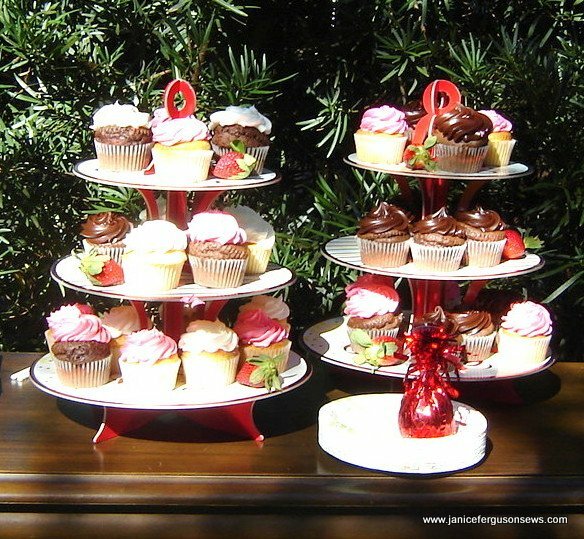 I just found out that my GGD will have a Minnie theme for her second birthday. Need to get a shirt or something done for her. How adorable is that dress! I love that you used an heirloom pattern for this dress and I will make a note on my copy that it runs a little big. I can hardly believe that a whole year has gone by since Vivian Rose’s birth. Goodness! Time does fly! She is just beautiful, Janice. What a blessing! Bobette, with the introduction of pink to the Minnie theme, you have more options. Have fun stitching something for your little ggd. Thanks, Karen. 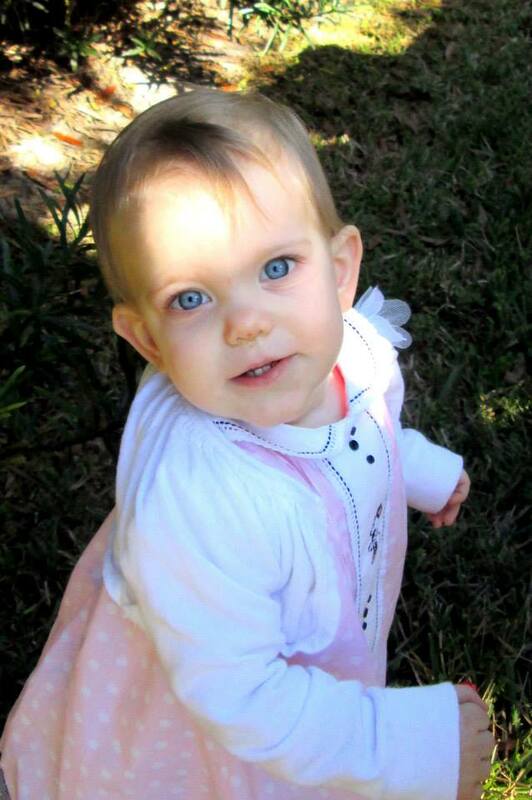 It is hard to believe she is already 1 and exuding her take-charge personality. It’s such fun to watch a child grow into herself. That looks so very pretty on her……….she is lovely! That’s just darling! Really love it and (dare I say it??) I am not much of a Minnie/Mickey fan. Thank you, Marjolein. Vivian Rose is much prettier without the wind blowing her hair every which way. 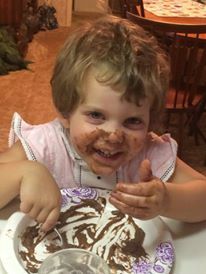 99% of the time, she fits the Mother Goose character…”There was a little girl who had a little curl right in the middle of her forehead.” That natural curl is there when she wakes up and all day long, except for the wind. Well, Janine, then that is high praise! Thanks! Your Minnie Mouse dress is adorable. I did a hotpink and whitepolka dot bishop with angel sleeves last summer for my daughter’s goddaughter. 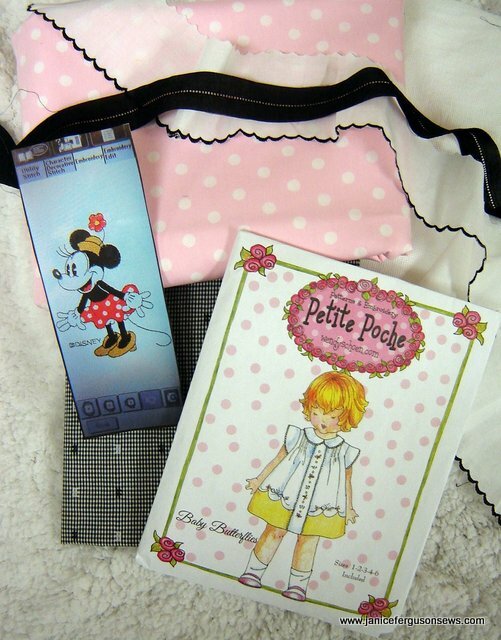 I smocked black silhoettes of minnie mouse, and edged the sleeves with lace with black floss woven through also. She wore that dress practically every day, as her mom is also a big disney fan. I do need a piece of advice, though. I love the dress on the new sew beautiful mag. I would love to make it for my niece, but she is a size 7-8. Need a good pattern for her size to smock full bodice, hopefully a simple style similar to the dress (Luminence). Thank you. 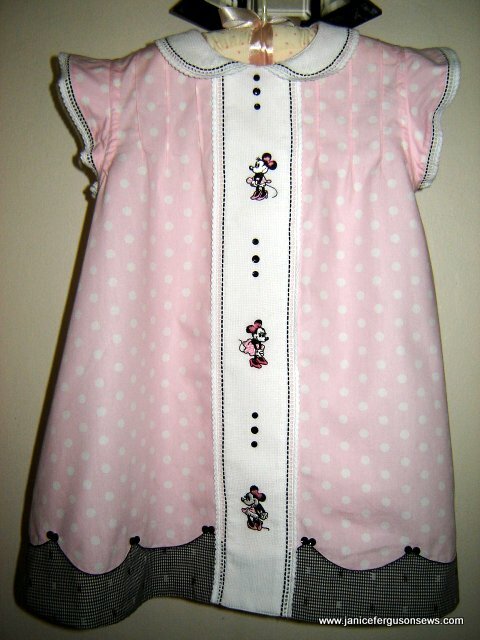 Lori, that smocked Minnie dress sounds absolutely adorable! I would love to see a picture of it! My new Sew Beautiful had not arrived yet so I don’t know about Luminence, but when it comes I’ll take a look at it and get back to you. 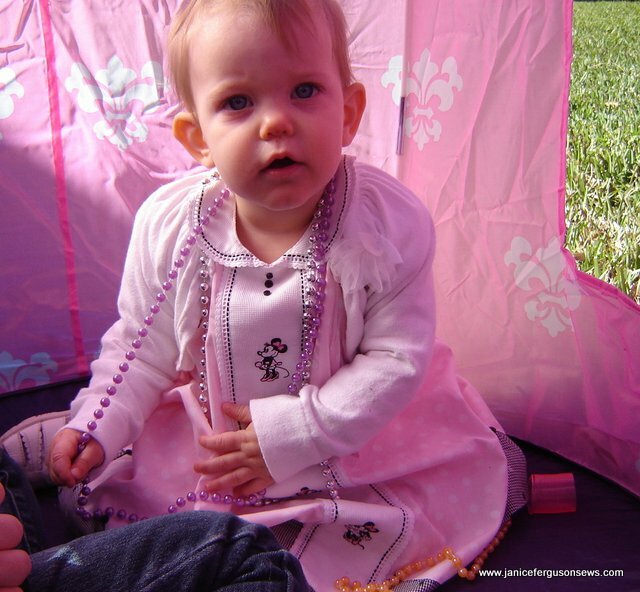 from MP forum: Oh my goodness, how cute is she and her birthday dress! I hope you took a zillion pictures of her first birthday party. I have that pattern but haven’t made it yet. One look at the cute dress on the package and I HAD to have it and now I see it looks even better made up. from MP forum: Love it. My GGD is turning 2 in Feb. and is having a Minnie Mouse theme for her birthday too. from MP forum: Your wonderful details never fail to amaze and delight me. Those little buttons on the scallops for the mouse ears, adorable. And the pink bow in Minnie’s hair rather than the hat, so cute. Love the floss you wove into the front. 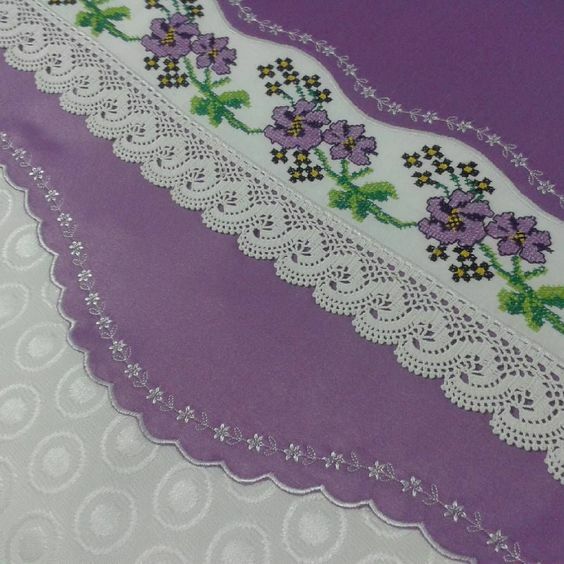 And the fabric choices are beautiful together. And, then, to top off an amazing job, that cute Minnie on the back. And I think it has all the heirloom details to make you happy without making Mom unhappy! I love heirloom looks translated to modern things and you carried this off so very well. Oh Janice, this dress is perfection and your grand daughter is beautiful!!! I love the contrast of the dark gingham with pink….black and pink look so currant and you’ve used such lovely heirloom technique here too. This blending of the old with the new is a really nice way to use our heirloom touches and still please modern Mamma’s and children. Thanks for sharing your wonderful work. from MP forum: lovely pretty much sums it up! as is the charmer that was wearing it! those beads and her delight make the picture of her in the dress…. good job hats off to your patience and creativity. Loved this dress. Obviously made your daughter happy that it fit her theme but still an AMAZING heirloom. Love, love, love. Thanks, Julie. I have a hard time NOT adding some heirloom techniques.